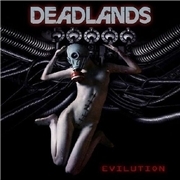 DEADLANDS may sound a bit daft as a band name, but behind the name hides lead vocalist Brian O´Connor (ex. VICIOUS RUMORS, CONSFEARACY). The rest of the band is not as known; guitarists Michael J. Gardner (THE COUNCIL) and Kevin Rohr (SPCTRE), bass player Steve “Deadbass” Northam and drummer Danny Sablan (HATE FX, THE COUNCIL). US power metal is the name of the game and the info says they combine heavy, thrash, power, groove and speed metal. They seem to be very active on the live front, playing with the likes of ANVIL, DEATH ANGEL, EXODUS, GREAT WHITE and Y&T. Guests on the album are stalwarts Hank Sherman, Michael Denner, Andy LaRocque ans Mike Wead (the MERCYFUL FATE/KING DIAMOND bunch), as well as Glen Alvelais (FORBIDDEN/TESTAMENT, Steve Smyth (NEVERMORE/FORBIDDEN) and Claudeus Creamer of DRAGONLORD. It seems the guest list exceeds the band. If you´re into the US semi-melodic power metal of the nineties thi sis your bag, if not there are so many other releases to check out. With the chosen path comes a slight lack of melody which combined with the archetypal strained vocals of Brian and that school of vocals can be a nuisance. Hence opener “Pandemic Genocide”, their self-titled chant “Deadlands”, the almost devoid of refrain “Gone Wrong” and the stale refrain of “Legions of the Dead” fare less well with me. On the bright side we have the chanting and firm refrain of “Final Solution”, the sweet groves of “Asphyxiate the Masses” and the riff heaven of “Path We´ve Chosen”. All of those are paths I wish the band had opted for. Instead I find the numbing boredom of “Shed My Skin” which I will never listen to again. Strange that there is so little inventiveness in US power metal?